Our panel of experts use the international break to take stock of the first month of the Championship season, which has seen Latics continue the momentum from last term’s League One success! STUART GLOVER: Saturday was not a vintage performance. It was certainly not the goal fest I ‘predicted’ last week. And it may seem disappointing we didn’t turn it on and keep up our good goalscoring form, against a team who have conceded a lot and are expected to struggle. Yet it was also good to see Latics grind out a result like that. Defend, if not well, then well enough. When things were not quite clicking for our attack, the fact we managed to get that goal, which was beginning to look a little bit too elusive, was excellent. I am absolutely convinced Saturday was a game we wouldn’t have won two years ago. Then again, last week I was certain it would be a goal fest! So what do I know? If the team performance wasn’t all that great, then the personal performance of Cedric Kipre was one of the highlights. He came down from Scotland, reportedly for a not insignificant fee, and was shoved into the team because Dan Burn was injured, and presumably to prevent Alex Bruce having to play. Defensive partnerships take time to develop, but it was Kipre’s personal performances that caused some concern. He looked hesitant. He was far too reactive. Wanting to stand off and waiting for situations to develop before dealing with them, rather than trying to prevent them developing in the first place. I don’t think Kipre will ever be the most comfortable player on the ball, but on Saturday he was far more proactive, attacking the ball rather than risking dangerous situations developing. Many thought Kipre was man of the match on Saturday, and I certainly see why. It was by far his best game for us and he deserves the award, but I thought Sam Morsy was the best player on the pitch. Sometimes his full contribution is overlooked. He is far more than just a ball winning midfielder, to an extent he is the heartbeat of the team. Yes, he gets his foot in when he needs to. Absolutely he is constantly in the referee’s ear giving him the Latics view on the game (well everyone else does it so why shouldn’t we? ), but he is also our safety net. The number of time Morsy was there to pick up loose balls, and secure possession after an attack broke down was incredible. The amount of pressure and attacking positions that were down to him getting hold of the ball and using it wisely was amazing. I love his occasional surging runs through midfield. But his main contribution is to get hold of the pieces of the game, and try to sort them into some sort of new order.Morsy, picking up the crumbs of possession, like a new super villain in Hansel and Gretel. And wasn’t it great to see James Vaughan get the winner? I know it would have been equally satisfying whoever had scored, but Vaughan has had to be patient and has not had the success he would have liked or might have expected. As Will Grigg has developed into the excellent front man we have today, and reinforcements have arrived in the form of Joe Garner, Vaughan may not make the bench at times. While it is true to say Grigg is a better player than Vaughan, that doesn’t mean it is a waste of time changing one for the other. Sometimes a different player can just be in a different place at a different time. And if that place and that time are the right ones, as they were on Saturday, that can be the difference between one point and three. Things just didn’t quite work out for Will on Saturday. The ball didn’t quite drop for him, or that final pass wasn’t quite right, or his contact wasn’t quite good enough. The change was made, a new impetus was found, the goal was scored, and we can all go into the international break a little happier and more optimistic. PAUL MIDDLETON: So, once again, the takeover has been delayed. Now, we’re being told, the final phase will be completed in September. This is following an original date of August 31. Quite what the cause for the delay has been, nobody seems willing to actually say. Anybody who has read my 12th Man contributions over the last few months will know I’ve been sceptical about the buyers, and the deal, since day one. And I have to say the drawn out nature of the transaction has done nothing to increase my enthusiasm for the any of it. From the start, there have been many questions which remain unanswered. Why is a Hong Kong company with no assets and a history of loss-making financial performance interested in buying Latics, when even the staunchest fan knows we will never make anybody rich? Why has there been so little information from either party? Why have we heard nothing from the IEC group? It is common for prospective owners to engage with fans as the deal comes to its conclusion, and yet there has not been a word from IEC, not even just to say ‘hello’. I could, of course, speculate as to what is causing the delay, but it would be either a blind guess or an assumption that is miles off the mark. But, as I’ve said all along, something still doesn’t smell right about the whole thing. I just hope that, in a year’s time, I’m not saying: ‘I told you so’. Back to on-field stuff, and things are going pretty well. Following our last, disastrous, season in the Championship, no one was quite sure how things would be. I think we’ve seen enough in the first half-dozen games, however, to say with reasonable confidence that we’ll be okay. There are rumours about Nick Powell’s contract negotiations which are a bit of a concern, but we’ll need to wait and see on that one. Top and bottom is that it feels right on the pitch, if not quite so much off it. I’m sure, as always, we’ll take it all in our collective stride. Actually, we all know we won’t and expect the now almost-daily fan meltdowns, but hey ho. Up the still technically for sale ‘Tics! BARRY WORTHINGTON: Wow, what an incredible start to the new season. Six games in and we have witnessed some truly exhilarating games. What players, what a team, what a manager, what a club! Okay, we aren’t storming the Championship with maximum points, we aren’t breaking goalscoring records, and we aren’t undefeated. But what we are doing is providing top-class drama and entertainment through exciting football, 100 per cent effort and having a real go. This first international break, although still a little early, gives us the opportunity to reflect back on the first six games of a season that, to be honest, didn’t have me filled with anticipation before the start. More to do with the last time we were here than anything else. From the first game against Sheffield Wednesday to Saturday’s win over Rotherham I have been completely hooked. All the games, bar our thumping of Stoke – that does sound good – have been on a knife-edge right through to the final whistle. Open football, lots of chances created, at times backs-to-the-wall defending and the odd dodgy refereeing decision all get the fans up out of their seats. We have certainly been entertained down at the DW so far. The stats make great reading also - our six Championship games have seen us have 92 attempts at goal, with 31 on target, an average of 15 attempts with five on target per game...did we have 15 attempts in total in our last Championship campaign? No wonder I am getting excited. The new guys that have come into the squad have all settled quickly. Reece James and Antonee Robinson have looked very good, considering their age and experience, Lee Evans plays like he never left in the first place and in Cedric Kipre it would appear we have picked up a real gem. A man mountain, comfortable on the ball, strong, dominant and at only 21, a real prospect. His performances have improved by the game, and against Rotherham he was quite simply outstanding. Am I getting carried away? No, I am old enough to know that football does have a knack of kicking you in the teeth. We have already suffered injuries to key players that could have disrupted things and players do lose form over a season. Also I don’t expect us to be challenging at the top, we will certainly lose games this season with our open style. But what really is exciting me – and I do believe that will continue – is the drama and unpredictability of each game we play...proper entertainment and well worth the price of a season ticket. So if you are wondering what to do with yourselves over the coming few months, and you haven’t already done so, get yourself a season ticket for the Latics. You can pay monthly - and you won’t be disappointed! SEAN LIVESEY: I said after the defeat to QPR it was important we bounced back on our own pitch, and Latics did just that on a Saturday with a well-earned three points against Paul Warne’s Rotherham. Our record at home in recent months, and since Paul Cook took over as manager is nothing short of remarkable. We’ve now gone 10 games unbeaten at home – since the heartbreaking FA Cup quarter-final defeat to Southampton. But looking at a longer period of time, we’ve only lost two of the last 30 at home. That is a brilliant record and, although it’s early days, we look well-placed to extend that record this season. Saturday’s game couldn’t be further away from the first two home games. Rather than Latics racing in to an early lead, as they did against Sheffield Wednesday and Nottingham Forest, Cook’s side had to bide their time. You always felt we would get the goal that our performance deserved, as with previous weeks we created numerous chances, Josh Windass, Nick Powell and Will Grigg all going close. The gaffer’s substiutions on Saturday definitely turned the game on its head. 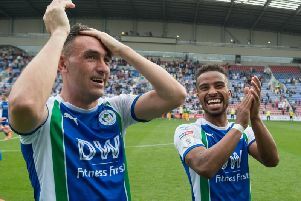 James Vaughan and Callum McManaman won’t have played as many minutes as they would have liked to this season, and McManaman in particular has faced a bit of unfair criticisim. But Callum’s eye for an opening is what directly led to Saturday’s goal. If you can get him fit and firing like the Callum of a few seasons back, he’ll be a great asset for us this season. One of the downsides of our return to the second tier is the return of international breaks, but it was a positive to sign off on the back of a win which cemented a very positive start to the season. But I imagine Cook and the players would rather be playing this weekend than not. An impressive 10 points from our opening games could have been even more, we’re four points off the league leaders and have a significantly-strengthened squad. The feel of positivity around the club is clear - and long may that continue. I’m still very much in the survival must be our first target camp, but there’s no doubting Latics have made an excellent start back to life in the Championship. KIERAN MAKIN: It certainly wasn’t pretty, but Saturday’s 1-0 win over Rotherham was as satisfying as any victory I’ve seen. Dwelling on the past can be dangerous, and I as a fan had several flashbacks of the Warren Joyce era, as the Millers continued to keep us out with backs to the wall defending. So many times under the leadership of Joyce did we see teams come to the DW Stadium and play in a conservative fashion, only to pick up all three points. Of course you have to be realistic. There will be teams who come to Wigan this season and do a job on us, simply because they’re better. However, and I mean this with no disrespect at all, we can’t let teams like Rotherham do it us. We have to pick up maximum points off those types of teams at home if we are to consolidate in this ruthless and relentless league. Overall, the start to the campaign has been very pleasing. We’re playing on the front foot and scoring goals with an entertaining style, which has not been disrupted by bringing in the new players who all look like great business. As for the international break, it will be debated whether or not it has come at a good time. Yes it could be a momentum breaker, but with Dan Burn, Darron Gibson and Joe Garner all expected to be fit for Brentford, we could be even stronger by the time the trip to West London comes around. a victory last time out over Rotherham, a side who basically came for a point and tried to frustrate us. We would be looking to build on the back of that win, to try and keep the momentum going. However, with a few injuries in the last couple of matches to key players such as, Michael Jacobs, Gavin Massey and Nick Powell tweaking a hamstring in the victory over Rotherham, maybe the break has in fact come at the right time. With Brentford next on the agenda, it will give us a period of time to get the players back fully match fit. Plus, it is also looking increasingly likely Darron Gibson and Dan Burn will be back in the matchday squad. I expect Paul Cook to retain Cedric Kipre as part of the defence, even though Burn will be pushing for his spot back in the team. Watching Kipre in the first couple of matches, I was sceptical as to whether he would cut in the Championship. As every match goes on, he seems to build more confidence, and his match of the match performance against Rotherham shows given time he will eventually become a vital part of our back-line.